Recently, podcasting has become a buzz word again. Though it began over a decade ago, even further back when you consider what is was before the term “podcast” was developed, it has recently become the norm again. Since it is based on listening, podcasts have become favorable for those who are commuting or just wanting to listen and learn while driving in the car. In addition, podcasts in education have become a great addition to the classroom. It allows for a project-based learning type of differentiation in the classroom. A podcast is a digital audio file that you can download from the internet or subscribe to via Really Simple Syndication (RSS) feed. Podcasting, or the term, has been in existence since 2004. This is when MTV video jockey Adam Curry and software developer Dave Winer wrote a program called iPodder. This program gave them the ability to automatically download Internet radio broadcasts to an iPod. During this time, RSS feeds became the norm (Web 2.0) so that users could subscribe to ever-changing websites. This RSS feed allowed podcast listeners to get audio episodes delivered to their feed. Podcasting began developing so quickly that in 2005, Steve Jobs, CEO of Apple, demonstrated how to create a podcast in GarageBand during his keynote speech. Make Moments Matter: A Music Education Podcast by David Row, who is an Orff Shulwerk certified K-5 general music teacher who shares his lessons, resources, and ideas through his podcast, as well as his Facebook group and Youtube channel. The Music Room: Aileen and Katie share ideas, lessons, and resources for a Kodály-inspired elementary music classroom. MuTechTeacherTalk: Heath Jones, a middle school music technology teacher, just started this podcast about music technology in the classroom. In his first episode, he interviews Meredith Allen, Education Specialist, with Soundtrap by Spotify. She explains how teachers and students can create podcasts in the classroom to enhance teaching and learning. She speaks to how to begin a podcast, how to record, how to brainstorm ideas for advertising, and how to deal with the amount of sound in the classroom when podcasting. Music Tech Teacher – Katie Wardrobe has been podcasting for the past year about integration of technology into the music classroom. 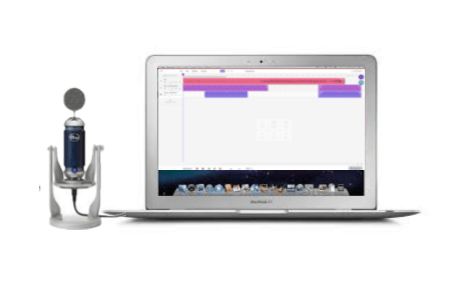 MusicFirst Podcast – MusicFirst Founder and Director, Jim Frankel, just started this podcast that focuses on interviewing music educators on how they integrate technology into their classrooms. Dr. Feierabend’s Podcast (coming soon) – Dr. Missy Strong, president-elect of the Feierabend Association for Music Education (FAME), is just about to debut the FAME podcast about all things First Steps and Conversational Solfege. 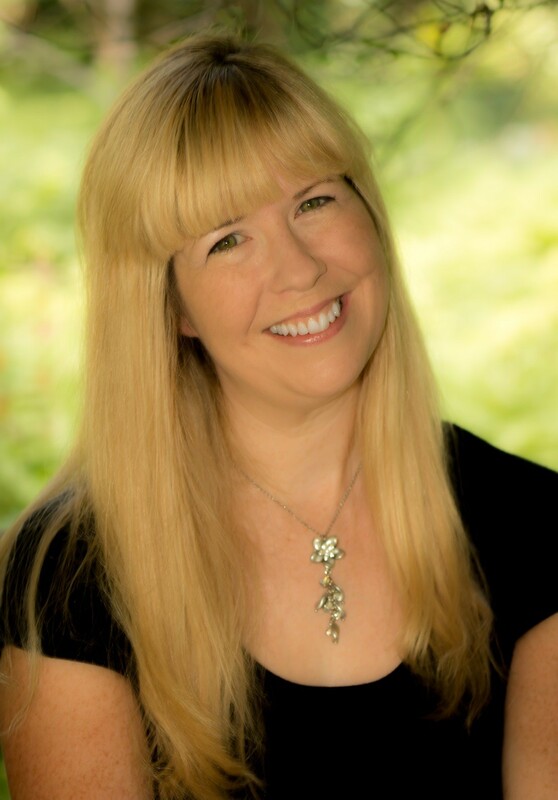 Coolcatteacher – Vicki Davis hosts a 10+ minute podcast interviewing teachers on subjects that ever educator can benefit. I was honored to be interviewed by her about Seesaw in the elementary music classroom. You can hear it below. Why Podcasting with Young Elementary? As Meredith Allen states in the interview listed above in the MuTechTeacherTalk podcast, when students podcast, it differentiates learning. For some students it can be challenging for students to write about a topic. When giving them the chance to podcast from ideas written in a thinking map, this can make an assignment successful for that student. In addition, podcasting can be a part of project or problem-based learning (PBL). Students can create a podcast to report about happenings at school, musical styles, composers, history of music, and so much more. With younger elementary, I have used it this week to give them a chance to “show what they know.” These are very short, simple podcasts that has them talking about, reflecting on, or performing musical concepts that they have learned in class. Since it is with kindergartners and first graders, the podcasts are teacher-guided. With older elementary, the podcasts can be more student-guided. 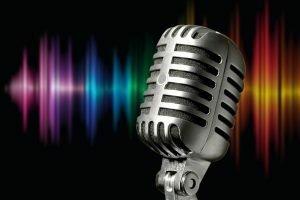 What Is Needed to Podcast? For these younger elementary podcasts, I still follow what Meredith suggests for older students when podcasting: think, script, record, edit, and publish. I thought about our musical objective for the lesson, briefly scripted the questions, recorded at the end of the class, edited at the end of the day, and published it via Seesaw, our student digital learning portfolios. Our target audience are the parents, so Seesaw was the best platform to publish. You can also download it as an mp3 file and send it to the parents, or make a QR code from it (place the mp3 file into google drive, create a link, and place the link in qrstuff.com to create a qr code) and place the qr code on a bulletin board for other students to scan and listen, or publish it on iTunes, Google Play, etc. The equipment needed is very basic: I used Soundtrap and a Blue USB Microphone (and learned to set the volume low in Soundtrap because we did not have headphones to use). 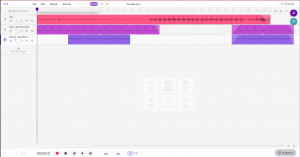 I love using Soundtrap as it is cloud-based, it can be accessed from mostly any device, it is intuitive to use, and it is basically the love child of google docs and garageband so you can collaborate online to create music, podcasts, and more. It is free to use, but if you have students using it, I highly recommend the EDU paid version where there are safewalls in place. Here are four podcasts from my classroom this week. As you can hear, I make mistakes with the tech. I learn from this and improve, as with anytime I make a mistake in the classroom. It also shows the students that I make mistakes and how I learn from them. Have you created podcasts in your music classroom? Please share!